From 2002 to 2012, Dr. Ron Hines—a retired and physically disabled Texas-licensed veterinarian—used the internet to give advice to pet owners across the country and around the globe. This advice was often free. Ron mainly helped people who lived in remote places without access to veterinarians, and who could not afford traditional veterinary care. No one ever complained about Ron’s advice. Then, Ron discovered that he had been on a decade-long crime spree. In Texas, it is illegal for a veterinarian to give advice online without first physically examining the animal. So the Texas State Board of Veterinary Medical Examiners shut Ron down, suspended his license, and fined him. Texas did this without even an allegation that Ron had harmed an animal. Although Ron fought back in a federal lawsuit with the help of the Institute for Justice (IJ), an appeals court agreed with Texas: even though Ron was giving advice, advice does not count as protected speech if it is part of an occupation. Since then, things have changed. In June, the U.S. Supreme Court confirmed what IJ argued in Ron’s first case: The First Amendment fully protects people who speak professionally. States cannot censor them without a compelling reason. And there is no such reason here. Furthermore, in 2017, Texas changed its laws to ensure that medical doctors could practice telemedicine without in-person examinations. If telemedicine is okay for doctors treating humans, it is okay for veterinarians like Ron. Now, Ron and IJ have teamed up again. Based on the Supreme Court’s ruling, Ron has filed another lawsuit to defend his First Amendment right to give veterinary advice to pet owners who need it. But this case is bigger than Ron. It is about protecting innovation, internet freedom, and free speech for Americans everywhere. Ron has loved animals since he was a boy. In addition to his veterinary training, he has a Ph.D. in microbiology. In 1966, Ron enlisted in the U.S. Public Health Service (PHS) and worked at the National Institutes of Health (NIH). In 1978, he was awarded the Surgeon General’s Commendation medal. He retired from the PHS reserve in the early 1980s as a Lieutenant Colonel. Ron left the PHS after a 1973 accident at an NIH facility in Maryland. He was fixing equipment in an animal lab and fell into a pit of machinery, crushing several vertebrae. Though not paralyzed, Ron lost most sensation below his waist and walks with difficulty and pain. Despite the injury, for nearly three decades, Ron worked as a full-time veterinarian, owning clinics in Florida and even working at SeaWorld. In 2002, Ron retired as age and disability made it difficult to maintain a physical practice. His love of animals did not stop with retirement. Ron launched a website, writing about pets and corresponding with pet owners. As he was soon flooded with emails from pet owners seeking advice, he realized that the internet presented a tremendous opportunity to share the wisdom and experience he acquired over a lifetime. The internet allowed him to share advice with over 700 pet owners on every continent except Antarctica. Some questions were straightforward. For example, in 2012, Ron helped a woman in Turkey devise a cat food recipe for her iodine-deficient cat. She had to make her own food because the commercial cat food for iodine deficiency contains pork, which cannot be imported into Turkey for religious reasons. The majority of questions, however, required Ron to be a veterinary Sherlock Holmes. Pet owners came to Ron when they had a chronically ill animal and local vets had given conflicting diagnoses. These pet owners, frequently buckling under mounting vet bills, sent Ron copies of lab reports, prescriptions, photos of the animal, and other relevant information. Ron sleuthed through the material, consulted veterinary journals, and then offered his perspective. He often saw errors in medication—either the wrong drug or the right drug at the wrong dose. Pet owners returned to their primary vets with Ron’s knowledge. Ron often corresponded with people in places where there were few, if any, veterinarians. For example, in May 2012, Ron received an email from a woman doing AIDS relief in rural Nigeria. She and her husband had brought their cat from Scotland. But there were no veterinarians in their area, so she used email to get advice from Ron. Some pet owners simply could not afford to visit a local veterinarian. One way or another, Ron was often the only option. He always made clear the limits of what he could do online. Sometimes, he could not offer any advice through email and the telephone. And when there was an emergency, he told pet owners to take their pets to a veterinary hospital immediately. Often, Ron used his contacts in the veterinary community to find pet owners free veterinary care locally. He simply helped in any way that he could. When he first began answering pet owners’ questions, Ron did not charge anything. He received so many inquiries, however, that he decided to charge a flat fee of $8.95 to screen out the minor issues. Ron gradually raised his flat fee to $58, which enabled him to focus on the most difficult cases where he could do the most good. When he could not help, he refunded the fee. The little money Ron made from his website covered only his expenses. He never made more than $2,800 in any year, despite working several hours a day, all year long. In fact, Ron did not even require people to pay. He answered all questions, whether the pet owner paid the fee or not. For example, Ron helped—for free—an impoverished man in New Hampshire who had lost both legs in an industrial accident and whose only family was his beloved dog. For Ron, helping pets was a labor of love. Ron always emphasized the human aspect of his advice. Many of his correspondents were elderly people living alone with their cherished pets. Ron often simply provided a kind ear when a pet’s case was hopeless. Ron never received any complaints, and no one complained about him to the Texas Veterinary Board. In fact, there was nothing radical about what Ron was doing. There are many websites where you can obtain individualized advice from a veterinarian (for free or for a fee). There are also call-in radio shows where people can get useful advice from a veterinarian without having to visit in person. So, in March 2012, Ron was stunned when the Vet Board told him that his advice was illegal. He was even more shocked when the Vet Board began formal disciplinary proceedings, despite the absence of complaints, let alone harm to an animal. Eventually, on March 25, 2013, the Vet Board ordered Ron to stop advising pet owners online. The Board reprimanded Ron, fined him, forced him to retake a portion of the veterinary-licensing exam, and suspended his license for a year. The basis for censoring Ron is the Texas Veterinary Licensing Act’s ban on establishing a vet-client-patient relationship over the phone or online unless the vet has recently examined the animal in person. (It does not matter if the examination had nothing to do with the advice offered later.) There does not appear to be any evidence that online veterinary advice harms animals. There is evidence, however, that the growing availability of online veterinary information has given pet owners an alternative to expensive in-person visits to their local veterinarians. In fact, Texas singled out electronic veterinary advice in 2005, when the growing availability of online information began causing pet owners to visit their local veterinarians less frequently. Thus, the primary effect of Texas’s law is not to help animals but to force pet owners to use brick-and-mortar vets in all situations rather than less-expensive online alternatives when that is sufficient. In short, Texas had become another battleground in the nationwide fight between people who want to use the 21st century technology of the internet to share their knowledge, and government licensing boards using a 19th century regulatory framework to control who may say what to whom. In 2013, with IJ’s help, Ron sued the Vet Board, claiming a First Amendment right to give veterinary advice online. The trial court agreed that Ron had stated a valid legal claim, but the U.S. Court of Appeals for the Fifth Circuit disagreed. Even though Ron had done nothing but speak, the appeals court said that the First Amendment simply did not apply to occupational speech. Ron’s speech has been impaired ever since. Usually, someone who had his or her case decided cannot sue again about the same issue. (This legal rule is called res judicata.) But there is an exception when there is a change in controlling constitutional law. That happened here. In June 2018, the U.S. Supreme Court explained that there is no professional-speech exception to the First Amendment. In a case called NIFLA v. Becerra, the Court explained that it had “not recognized ‘professional speech’ as a separate category of speech. Speech is not unprotected merely because it is uttered by ‘professionals.’” This means that the appeals court in Ron’s first suit was wrong to treat Ron’s words as conduct. And that is not all that has changed. In 2017, Governor Greg Abbott signed SB 1107, which allowed medical doctors to practice telemedicine in Texas without an in-person examination. This change represents Texas’s judgment that it is often safe and effective for medical doctors to treat human patients solely via the internet. So, Texas law allows 21st century innovation for doctors, but vets are forced to remain in the past. On September 27, 2018, armed with the Supreme Court’s new ruling, Ron sued again to protect his First Amendment right to give veterinary advice. There is more to this case than Ron. Ron’s free speech challenge is blazing the trail for occupations to operate by tele-practice. Millions of Americans use blogs, social media, and other online venues to obtain advice about topics such as parenting, pregnancy, marriage, and other serious issues. If lower courts ignore the Supreme Court’s clear message—if governments are free to censor advice from the one in four Americans who need a government license to work—Americans and the First Amendment will both be worse off. For his part, Ron is going back to court to ensure that he, and everyone who gives advice online, can exercise their right to free speech. Dr. Ronald Hines is a Texas-licensed veterinarian and a resident of Brownsville, Texas. He is 75. The Defendants are the members of the Texas State Board of Veterinary Medical Examiners, all of whom are sued in their official capacities. Ron has brought three claims. The first is that the First Amendment prohibits Texas from requiring Ron to physically examine an animal before offering veterinary advice. This is censorship without a compelling reason. Ron has also brought claims based on Texas’s modification of its telemedicine laws. Ron’s second claim is that First Amendment prohibits Texas from discriminating against the speech of veterinarians (who cannot speak without an in-person examination) and in favor of doctors (who can). Ron’s third claim is that the 14th Amendment’s Equal Protection Clause similarly prohibits subjecting veterinarians to restrictions that are unnecessary even for doctors. The litigation team consists of Institute for Justice Senior Attorney Jeff Rowes and Institute for Justice Attorney Andrew Ward. The Institute for Justice is the nation’s leading legal advocate for First Amendment rights and economic liberty. 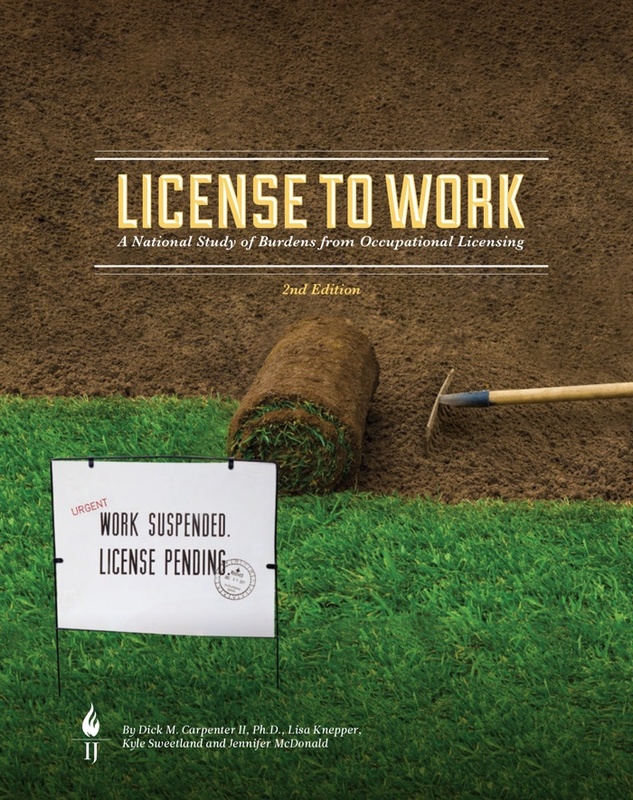 The Institute has challenged efforts to use occupational licensing laws to silence speech by a North Carolina blogger; For Sale By Owner websites in California and New Hampshire; interior designers in Connecticut, Florida, New Mexico, and Texas; and tour guides in New Orleans, Philadelphia, and Washington, D.C.